Please refer below link to have detail explanation. 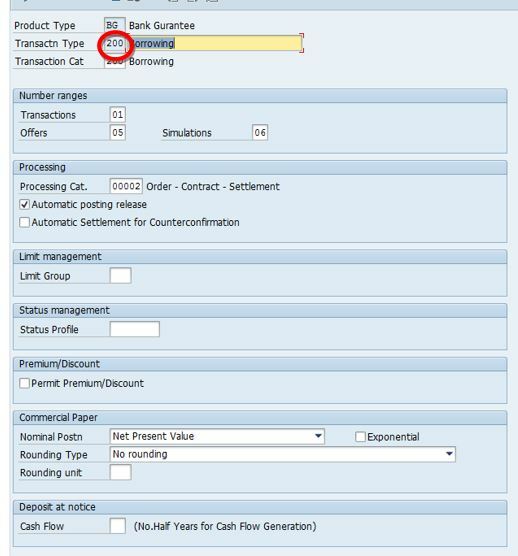 IN EHP-8 Version SAP has provided standard function for Bank Guarantee/Letter of credit under customization of trade finance, however if the client is in lower version of SAP we can use the sample below example to meet the client requirement. Please note this is just an example of how I met the expectation of client. Product types help to differentiate between different financial instruments. 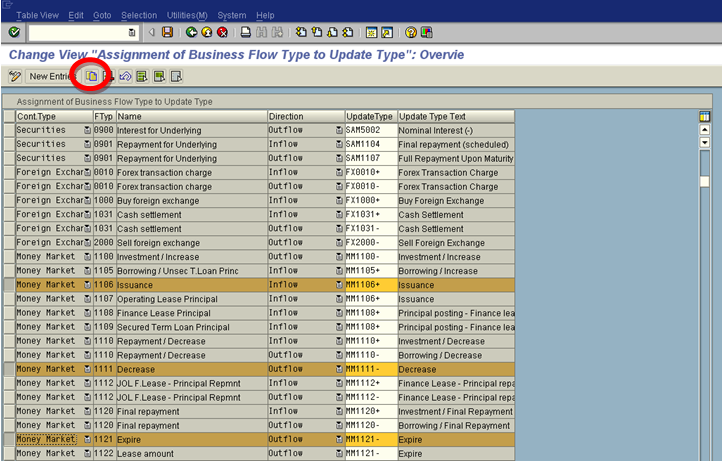 Flows describe various payment flows arising from transaction conclusion,valuation and accrual/deferral functions as well as transfer postings. They are classified through flow types that you define in Customizing. 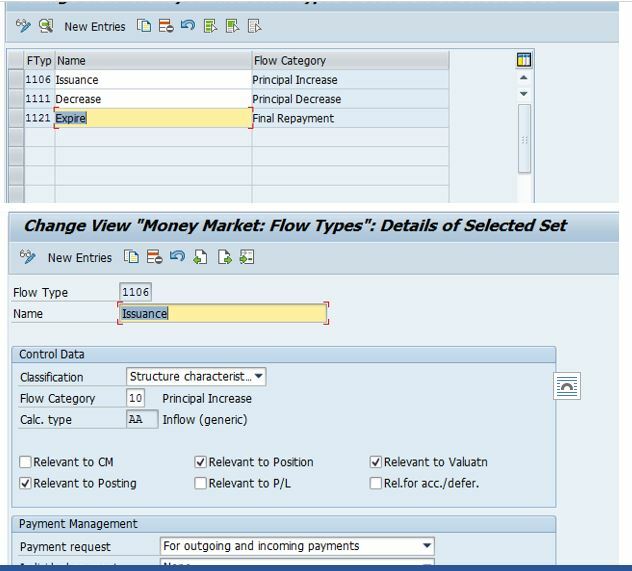 In this step, you assign flow types to each product type at the transaction type level that are necessary in order to completely portray a financial product. Condition types automatically generate flows which are the basis for further processing in FI and Cash management as well as for analysis in Market risk management. 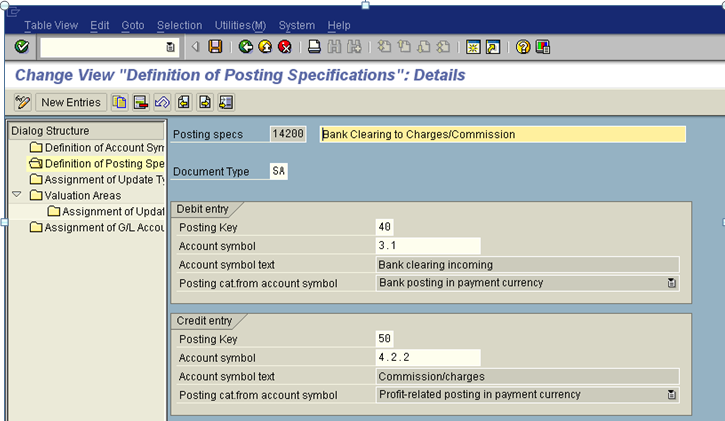 Necessary condition types are assigned to each product type at transaction type level to be able to represent a financial product completely in the system. 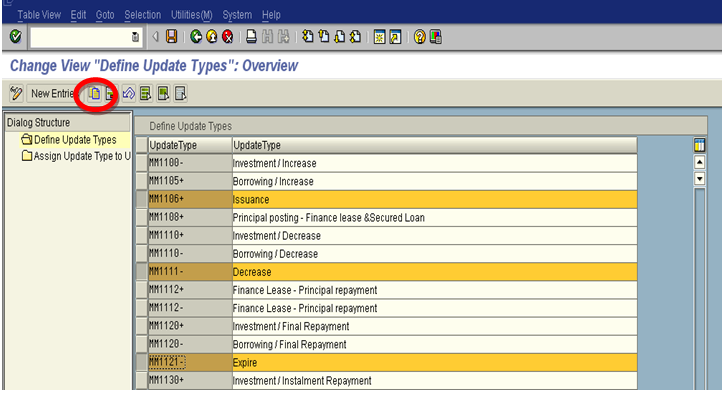 Update types are used to carry information about flows to accounting and the securities and futures account management of the Transaction Manager. 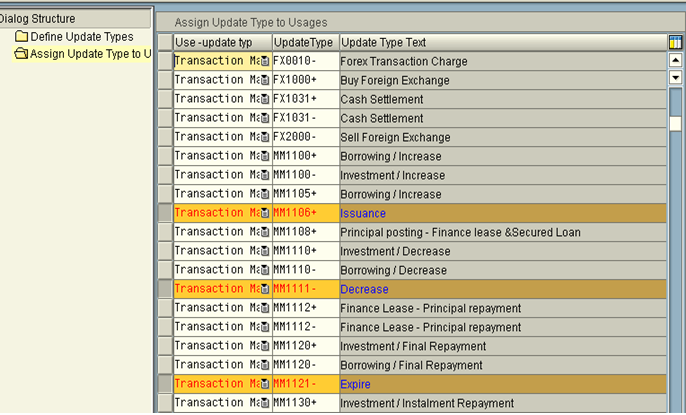 In this IMG activity, you assign the corresponding update types to the flow types in the Money Market, Foreign Exchange, Securities and Derivatives areas for updating the transaction data to the parallel valuation areas. In this IMG activity you specify whether or not the update type is relevant for posting. If you flag an update type as not relevant for posting it is not posted even if an account determination was specified in Define Account Determination. 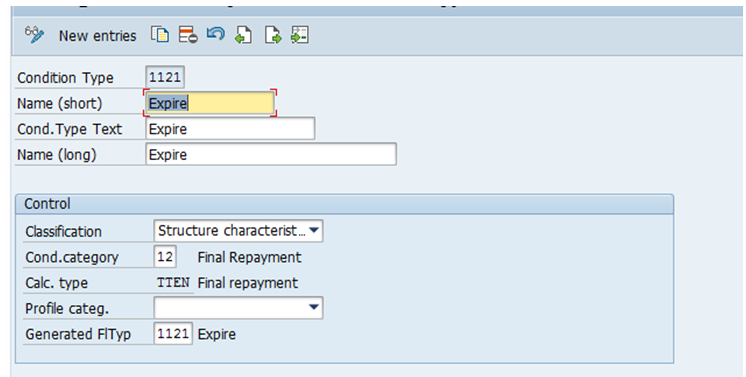 In this menu option you define the account assignment references for each product type. Account assignment references are required for each sub-ledger position. You can use the account assignment references to determine the G/L account in FI in which the relevant position is to be managed. 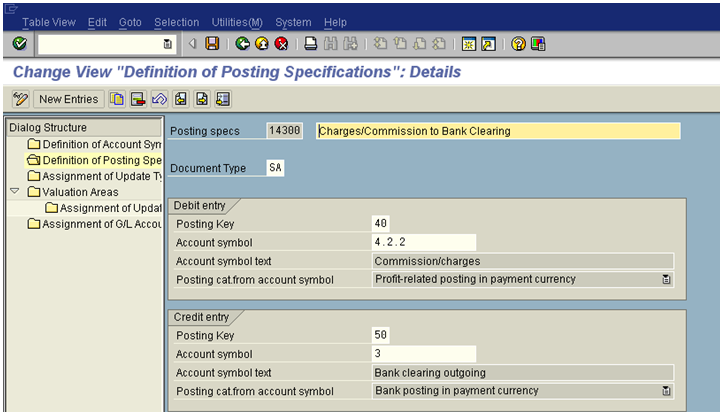 You can use the account assignment references to control the posting of the sub-ledger positions in the general ledger. 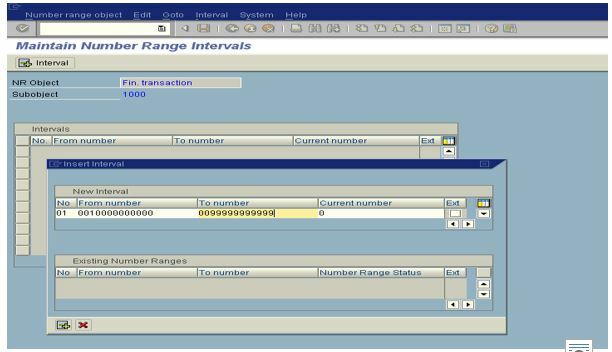 In this IMG activity you can define rules for automatic determination of account assignment references for the parallel valuation areas. 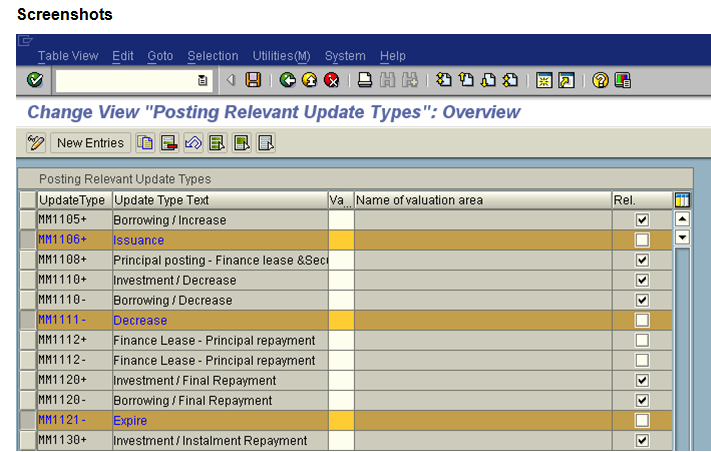 In this IMG activity you define the account determination settings for the flows in the parallel valuation areas. The account determination settings define the accounts to be used when the flows are posted to Financial Accounting.